In this episode of Reconnect, Andy shares five objections Muslims routinely raise against the Gospel. He also shares responses that answer their objections with opportunities to share the Gospel again. Intentionally committing suicide to kill those who are your enemies in recent decades has been almost exclusively associated with Islam. Many are arguing that all forms of terroism have no role or place in true Islam, thus those who claim to be killing themselves to kill others in the name of Allah are not true Muslims. I don’t want to address that topic, right now. I did find a very good article post from Middle East Forum entitled, “The Religious Foundations of Suicide Bombers”, that I believe has done a very fine job of citing early Islamic theologians, the Qur’an, and the Hadiths to demonstrate why we are witnessing suicide attacks in the name of Allah. I want to take the time to find all the citations and then write a post afterwards to show if I agree with the article after reading the citations. Without looking up all of the citations first hand, I think the Middle East Forum presents authoritative Islamic texts that Muslims can use to support terrorism and violent acts against non-Muslims. But that’s not the intent of this blog post. I want to address the point that Samson is a Biblical example that parallels Islamic suicide bombers. Is it justifiable to kill yourself if it is to kill those who are enemies of God? 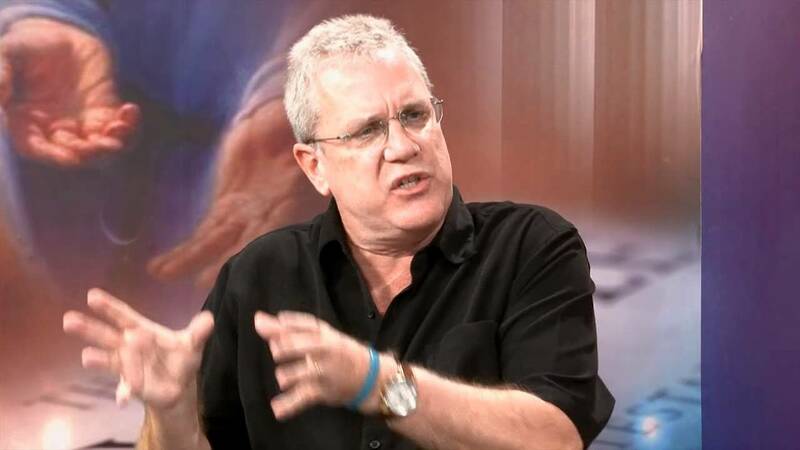 If the Christian says no, how could we respond if someone raises the objection of Samson? If you are unfamiliar with Samson’s life and death, it can be found in Judges 13-16. Samson brings down the house, killing about 3,000 Philistines. This passage of Scripture can certainly be troubling. It means that God empowered Samson to kill not only himself, but also women and children. He wasn’t just killing the men who captured him and took his eyes. There are answers to this moral conflict that fit within the Biblical worldview that can ease the tension we sense over this horrible calamity, but outside of the Christian worldview they likely won’t satisfy, and even within the Christian worldview, we may not be satisfied. There are also some very clear ways in which this event is far different from God giving his approval on such acts as suicide bombing! 1st – Samson was a judge over Israel, the people of God. The position he had was appointed by God. Justice needed to be served. The false god and the temple of the Philistines should not prevail against the real God of the universe. Samson prayed to the Lord and asked for vindication against the enemies of God, and he was willing to offer his own life in the process. His death was not a self-righteous vindication either. He was laying his life down for the good of God’s people, that they might be spared from their enemies, even if it cost him his own life. 2nd – Samson’s strength always came from God. He attributed it to his long hair and vow, but in his final prayer, he is acknowledging that his strength was from the Lord. Scripture says that the Philistines were entertained by the spectacle of their enemy, Samson, captured and blinded. How were they entertained, unless they were laughing and mocking him? They likely were calling on him to save himself, to perform a great act of strength as he had done before, many times in his life. Since he was a judge, a representative of God, the Philistines in the house of Dagon were thus mocking and challenging the one true God. Foreshadowing and pointing to Jesus’ death, Samson gave his life to put an end to the enemies of God. Jesus Christ, when he was mocked, delivered a death blow to sin, death, and the devil, and reconciled all of humanity back into a relight relationship with God through the shedding of his own blood. 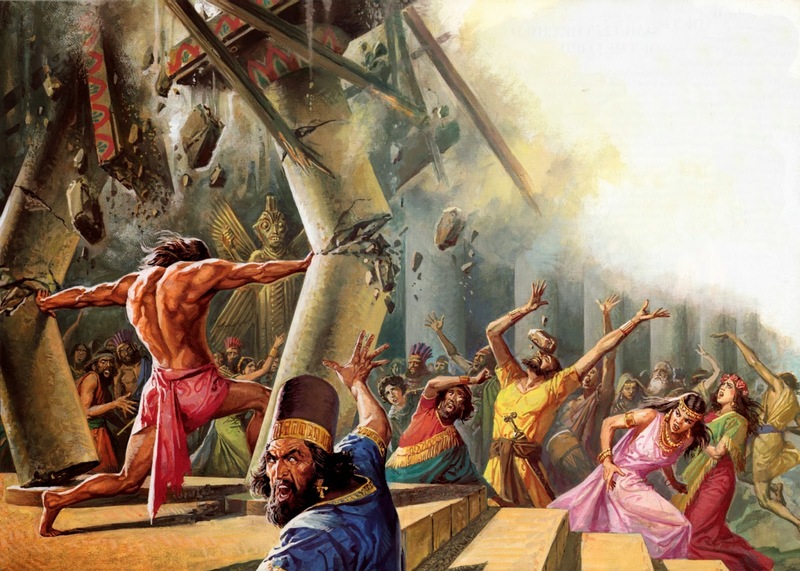 3rd – Samson’s death was far different from that of a suicide bomber. Samson was captured, his eyes had been taken, he was shackled, and he was likely going to be put death. The taking of his own life was clearly done through supernatural powers given by the Lord that he directly prayed to for help for vengeance against his enemies. A suicide bomber on the other hand is not doing anything supernatural. Bombs are not supernatural, thus cannot be confirmed to be approved by God. Suicide bombers have not been captured, they have not been tortured, and they are not being held captive and mocked in an act of worship towards the god of their enemies. Suicide bombers are not God’s chosen representatives of his judgment amongst his people. I recently attended the Vertias Evangelical Seminary National Apologetics Conference 2014 at Calvary Chapel, Costa Mesa (technically Santa Ana), CA. The Qur’an is not narrative. There is no beginning, no end. It is not a book for Muslims to study, but to memorize. This is the book they do not question; it is above criticism. It’s a capital offense to criticism it in certain countries; penalty is seven years imprisonment. The radicals have read the Qur’an, they trust it. Don’t we Christians do the same thing? We read our Bible, we trust it? Don’t we start from the same paradigm? We are uniquely positioned to reach Muslims. Radical Muslims force Christians to convert, pay the tax or die. This is based on the Qur’an. We are the only ones that can confront their ideology. The government cannot do this. In order to confront violence, we have to confront the Qur’an. When you compare, there is simply no comparison with the Bible. Muslims always say the Bible has been corrupted. I always ask 2 questions: where and when? But Qur’an says to come to the Christians for answers and don’t even argue with Christians. We have had a real problem with Muslims confronting our manuscripts. We have more than 5000 Greek and when you add the copies into other languages it’s more than 24000 copies. But it is true we do not have the originals. What manuscript evidence is there for the Qur’an. Muslims claim to have the original manuscripts. It was supposedly given by way of divine revelation to Muhammad who couldn’t read or write, and then passed through a few people. Four copies was made and sent to different cities. Those four copies exist today. They claim that there is no comparison to any of their Suras but just open Psalm 23 and compare to any Sura. Was it compiled COMPLETE at the time of Ithman in 650AD? Is the Qur’an UNCHANGED since 650 AD? Every letter, word, sentence, chapter? Where are those Uthmanic copies from 650 AD? The claim is that the original copies still exist. Topkapi Mushaf, Sammarqand Mushaf, Shabir Ally and a few more. The challenge is that it’s difficult to get access to these. But in 2002 study was done and released in 2009 concluding: we have none of Uthman’s Mushafs (manuscripts); they date from the early to mid 8th century and are not the originals. They find over 2000 differences from the cannonical version, is full of grammatical deviations (errors), with spelling mistakes. The Sammarqand Manuscript is the same; only goes up to chapter 43 and the author didn’t use very good Arabic. Ma’ll Qur’an is only 53% and dated late 8th century. Petropolitanus is early 9th century, full of corrections, have obvious corrections and only 26% of the Qur’an. Husseini is early 8th century, full of vairants. Sana manuscript couldn’t be read at first; Sura 20,21 show two different styles of writing from two different time periods showing the Qur’an has evolved; also contains manuscript variants (1000 just in this Quran); they could actually see another version underneath. Jay Smith sources all of this from Islamic Answers, a Muslim website. He challenged the founder of this website to reveal one original, complete manuscript and the founder walked away. Jay then projects unpublished research which revealed over 800 textual variants. Since this has not yet been published yet, notes will not be provided here. It seem to be that THERE WAS NO QUR’AN until somewhere in or after the 8th century, long after Muhammad. He debated the best Muslim debater and he had no refutation. Finally! Let’s show what Christians know about the Word of God, that is Jesus Christ, the Word of God who made himself known in the flesh according to John chapter 1. Jesus, the Word of God is Eternal. Jesus the Word of God has come down to us. Jesus the Word of God is the complete revelation of God to us. Prove it – Jesus lived, died, and rose from the grave for the forgiveness of your sins! OH, and he shared some amazing stuff that is yet to be published and asked not to be shared yet, but he actually projected the manuscript copies for us to see of this new research. 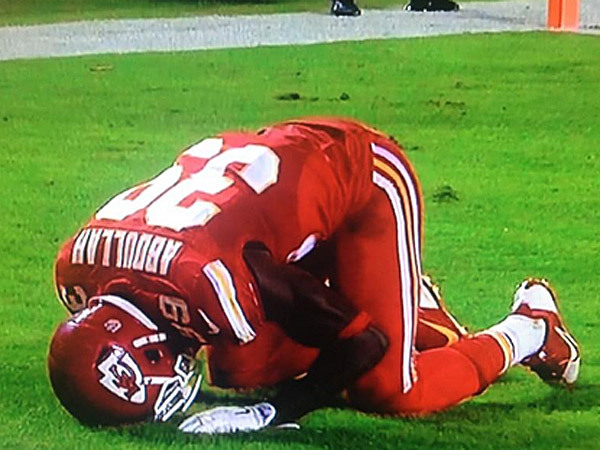 Was Chiefs Player Husain Abdullah Penalized for Muslim Prayer? Chiefs defensive player, Husain Abdullah, picks of Tom Brady’s pass! I love it. He then runs it back for a touchdown. Tom Brady gets knocked down in the process. I love that too. Husain Abdullah slides on his knees in the end zone. This isn’t rugby! You don’t need to do anything like that to score a touchdown. You don’t literally have to touch the ball down to the ground to score like you do in rugby (a sport that is way better than American football!). But, whatever, I’m used to celebrations in the end zone. I would assume that it’s OK to slide in the end zone, but I don’t know the rules about what constitutes a penalty for celebrating in the end zone, or if celebrations are fine on the sideline – or not acceptable at all – I just don’t know. I don’t watch much football. I just watch the highlights that appear in my Yahoo news feed. Here’s the big controversy, after the slide onto his knees, Husain Abdullah, goes into a prostrate position that resembles a Muslim prayer position. And Husain is a Muslim! So, he is praying to Allah, clearly, AND he gets PENALIZED! Christians do this all the time in NFL games – they get on a knee to pray, or they make the sign of the cross (which indicates not only the work of Jesus of Nazareth, but it is an invocation of the Triune Lord), or they point to the sky to indicate that God gets the glory. Tim Timbow comes to mind, though he hasn’t played in the NFL in awhile. Tebow never received a flag for excessive celebration, but Husain Abdullah, making a Muslim prayer DID receive a 15 yard penalty. Husain Abdullah prostrates himself in the end zone in prayer to Allah after scoring a touchdown. Husain said after the game that he thought the penalty was because of the slide onto his knees! Not for the prayer! He never spoke to the ref about it, and the ref didn’t speak to him! The ref announced that the penalty was “for falling to the ground on his knees”! This could mean he was flagged for the prayer, OR it could mean that he was flagged for the manner in which he fell/slid into the prayer position. This obviously is controversial because Christians don’t get flagged for their signs of worship, thanks, and praise to the Triune Lord! Was Husain flagged for the prayer, the prayer that was made to Allah in a clearly Muslim position of prayer? Is this a sign of prejudice? Is this a sign of intolerance that the Muslim gets penalized, and the Christian does not? Or was it really a penalty for the slide? Does the manner in which a player gets into the prayer position make a difference? Christians haven’t slid into a kneeling position to prayer! Though Tim Tebow likes to show off his guns in the manner in which he kneels when he WAS a player in the NFL. 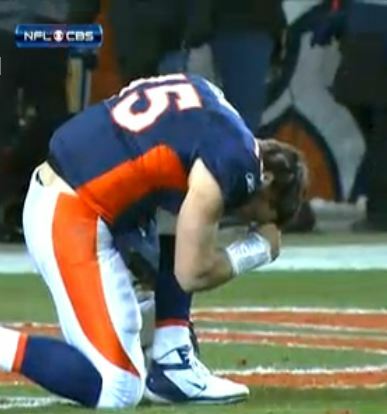 The famous, or infamous, Tim Tebow prayer position during a football game. Or is this a sign of ignorance? Did the ref not know that Husain Abdullah was praying? Did he not know the physical posture in which Muslims pray? Was he just not accustomed to seeing Muslim players pray in the end zone, because there aren’t too many Muslims scoring touchdowns in the NFL, who are then wanting to display thanks to Allah? Also, I’d love to know when the flag was actually thrown. Was it thrown on the slide? If it was, this wasn’t prejudice. If it was thrown after… then this is still open to debate with the only true way of knowing if this was prejudice or ignorance, by asking the ref some questions. Why do we bow our heads and close our eyes as Christians to pray? It’s not in the Bible saying that we must do this, is it? And if I had to close my eyes and bow my head, and hold my hands together to pray, I wouldn’t be able to pray in all the times I listed above! Do Muslims have to be in a prostrate position to pray to Allah? Can Muslims pray to Allah as they go about their daily activities? Are Muslims able to pray in a direction that is not facing Mecca? Was the end zone in which Husain prostrating himself facing Mecca? If it wasn’t, is that a problem? What if he scored on the other end zone later in the game, would that be conflicting at all in terms of the direction he was facing? When Christians pray, we can pray about anything on our hearts and minds. Scripture tells us, “Do not be anxious about anything, but in every situation, by prayer and petition, with thanksgiving, present your requests to God” (Philippians 4:6). Is it this way for Muslims? Can Muslims present any request to Allah? Or are the prayers rote, repetitive prayers? Christians can pray at all times, and in all places, and God will hear the prayer that is made in his name. Is it this way for Muslims? Or must the prayers be made at the five daily prayer times to be heard by Allah? If so, was Husain’s prayer even acceptable by Allah? Especially if it wasn’t facing Mecca? I’d love to hear feedback to these questions! Comment away. Subscribe to this blog or follow me @AndyWrasman on Twitter. Check out my book, Contradict – They Can’t All Be True!